Cbm music, watching football (a Newcastle fan), reading and watching TV and films. He also has cerebral palsy. With no speech, he is the world’s first stand up comedian to use a communication device, most recently an iPad. Lee has performed in gigs all over the UK and received coverage from the BBC, CNN, The Sun, The Mail on Sunday and The Guardian. As well as fundraising and giving speeches for countless charities, he is also a patron of Find a Voice and Communication Matters. As the world’s first silent comedian, it is easy to see why Lee is a role model for many. When did you first decide to become a comedian? Just last year really. Some of my mates said it might work and that I should give it a try. I thought they were mental. I struggled to see how it would work. The idea stuck in the back of my mind though so I eventually decided to give it a try because I knew I’d regret it if I didn’t. Right now, that seems like a very good idea! What attracted you to the world of comedy? I’ve always liked watching stand up comedy and making people laugh so this is probably my dream job. I just never thought about it seriously until my friend suggested it. I thought it would only ever be a dream. Did you expect the kind of attention that you have received from the media? Not at all. I just thought that I’d give it a try and see what happened. I never expected any of what happened next. I’ve supported my comedy idol, Ross Noble. I’ve gigged all over the country. My friend said he saw me on CNN in South America. And now I’m doing the Fringe It’s still all a bit surreal! As delivery is so important in many comedians acts, do you feel you’ve become more reliant on content? Or is the voice of the iPad a delivery in itself? I’ve never really thought about it like that. I guess I do rely on content a bit more, but that’s probably a good thing. I do think that my posh Robocop voice is funny in itself though. I’ve also had to learn to write in a way so that t’s easy to pause to allow for laughter when needed. It’s trial and error but I think I’m getting better with my timing. Do you think that what you’re doing will inspire other people with cerebral palsy ? That was never my aim but apparently it does. Other people have said so. I just think of myself as a guy who tries to be funny, but if I inspire people then that’s a bonus. Have you experienced discrimination in your profession? Only if you count the fact that nearly every comedy venue is up/down a steep flight of stairs! Who are your main influences in comedy? Ross Noble is my comedy hero, I just love how quick his mind works and how random he can be. I also loved watching The League of Gentlemen. It’s still as funny now. I think that helped develop my twisted sense of humour too. Either David Cameron or Nick Clegg. I can’t decide. What can we expect in your upcoming Edinburgh show? Well it’s a look back at my life so far and how I grew up with my disability. When I was little the doctors weren’t sure what was wrong with me, probably because they didn’t have Google to check in those days. So it covers my school years, going to university, auditioning for X Factor when I can’t even sing….the usual stuff really. What plans do you have for the future? Are there any projects you’ve been working on? Nothing in particular. As long as I keep gigging and enjoying myself, I’ll be happy. 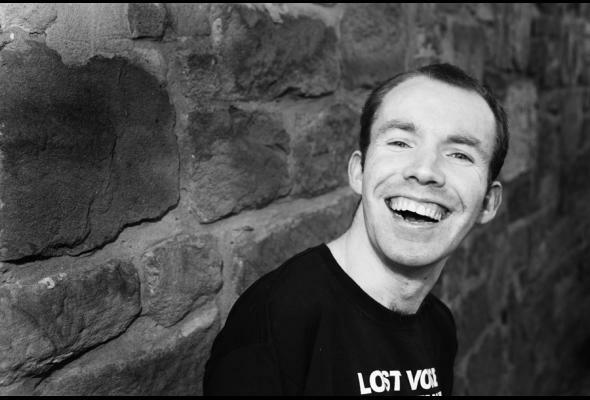 Lee is taking his debut solo show ‘Voice of Choice’ to Edinburgh this year. He’ll also be performing in a free show ‘Are you a techophile’ with his ‘comedy partner in crime’ Emily Wood. Find details on his website: lostvoiceguy.com.